Great martial arts & acting, beautiful sets and scenery. However, the story was hard to follow (especially with all the subtitles). Very good movie, kept me on the edge of my seat all the way through. I could understand how important family honor is in China and how the Japanese invasion of China had changed the lives of the people we love the most. Good Good movie. It is very good as long as you read about the film ahead of time. Otherwise it can be confusing with all the jumps in time and the different characters involved. Amazing blend of Kongfu and visual art! Love Ziyi! Art and style. Partially true story based on Yip Man who later of course taught Bruce Lee. Although the female lead is fictitious, she creates a powerful, unforgettable character. Poetry in motion. The two lead actors are superbly cast. Enjoyed the pithy wise remarks on life interspersed throughout. Especially loved the mental agility to "feel" an opponent and anticipate every move. And little details like the close-up of the female shoe sliding mesmerizingly backwards in fight scenes are just icing on the cake. Wonderful scenery and historical backdrop. Cinematography is oscar-worthy as well. Would definitely want to go to see this movie again. Magnificent. Art and style. Very well crafted movie. 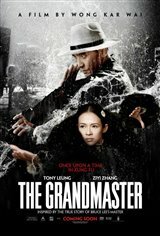 Partly based on Yip Man who taught Bruce Lee. Stunning scenery, glimpses of history. Although the female lead is fictitious she creates a powerful, unforgettable character. Both lead actors capture your attention. Loved the pithy wise sayings interspersed throughout, reflections on life. And the mental agility to "feel" your opponent and his every move. Amazing stuff. Would watch it again.